Modern karate and much of sports-oriented martial arts do not incorporate the powerful body mechanics found in old Okinawan karate (especially the Shorin varieties*), traditional Japanese jujutsu, and the old Chinese internal styles. If understood, these old ways of using the body can be adopted, even if only in part, or adapted to fit within any modern style to increase the power and speed of your technique. Hallmarks of old Okinawan Shorin-ryu body mechanics include the use of arches, compression, torque and the efficient use of the koshi (hips combined with the lower abdomen, lower back, pelvis and upper thighs). These were at one time considered the foundation of good martial performance and effectiveness. Of these elements perhaps the least understood are strong, dynamic arches -- how they are created and/or maintained within body stances, posture, and techniques (even within grips!). Arches run throughout the body, from the toes to the base of the skull, without any thought or conscious interference from us. In addition, we can of our own volition make and unmake arches throughout our body, at the speed of thought. It's fairly easy to see, with just a little analysis, that strong arches give stances their stability. It's harder to see a more important contribution of arches—generation and storage of power. It’s even harder to see that a strong—but dynamic—arch can lead to greater speed. But it's indeed true that by means of strong, dynamic arches we can generate extra power and greater speed, at almost any moment of our choosing, without any need for any sort of wind-up. Because an arched span is always stronger than an angled, straight, or hinged span of equal length, weight, and mass, whenever possible we should treat our moving or stationary body as though it is an arch, or big bundle of arches, rather than try to keep it hinged or ramrod straight. This includes regarding joints such as elbows, knees, shoulders, hips, ankles, and so forth as arched rather than articulated, or hinged, however counterintuitive that may seem at first. The same goes for your arms, legs, and torso. It includes also making sure to examine each technique that we perform to see where and how the arches run from the body and through that technique. We need particularly to remember, as well, that while it can be very useful to visualize the arches at our service, these arches are real physical entities and not just useful figments of our imagination. To begin making good use of arches, we need to understand the difference between a static arch and a dynamic arch: Static arches are those arches that are rooted and immoveable. Static arches are capable of storing increasing amounts of energy (a bridge support, e.g. ), but they can only rebound in the direction from which they are loaded. Dynamic arches are those arches that are firmly rooted, as well, but not so rooted as to preclude movement. Dynamic arches can release stored energy in any of many directions. In a dynamic arch, it’s the center of the arch, rather than the rooted ends, that is in control and that is more important. Static arches are useful for martial arts, but they are never as useful as dynamic arches. Before we can use arches to maximum benefit, there are two basic principles we need to understand about them. The first is that loaded arches generate power upon release. And the second is that unloaded arches absorb shock and, as the shock is absorbed, become loaded arches. The corollary is that—up to the point of structural failure—the more weight that is loaded onto an arch the stronger the arch becomes. There is also a less basic, and more important, principle: With the proper understanding and training, we can adjust, load, and unload the arches within our bodies and within our techniques at will. We need also to keep in mind that arches needn’t be symmetrical. Here are some examples of the most common arches we can make in various parts of the body. Arches: Upper row left – simple symmetrical, anchored at the bottom; upper middle – simple symmetrical, anchored at top; upper right – asymmetrical; 2nd row – wide symmetrical, anchored at either top or bottom; 3rd row – complex arch; 4th row – convoluted arch. The first four of the arches illustrated above are the most important. Complex arches are hard to master and are, thus, less immediately useful. The last arch illustrated is an exaggeration of what we sometimes see in very bad stances. Conversely, it is also an exaggeration of what we sometimes see in extraordinarily fluid and talented martial artists. There is another sort of arch that often comes into play in our technique. That is a simple arch, either symmetrical or asymmetrical, wrapped by or within a spiral. 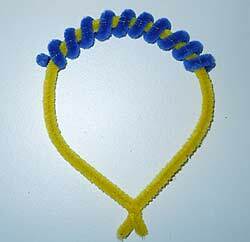 I’ve included a photo of a model of that arch, made from two pipe cleaners. In general, and especially for beginners, we can say that all arches are anchored in the feet or hands and centered in the hara, or in the koshi. This is not absolutely true, as, for advanced practitioners, some arches are centered in the small recess between the scapulae—right between the shoulder blades. But until you have good control of the arches that are anchored through the center of the body, you don't need to deal with the shoulder arches. A good place to start in analyzing arches is with basic stances. We often damage our skills by purposely training to make our stances too low. We do this to make our legs stronger, but in practicing this way we make our stances weaker at the same time. There are better ways to strengthen muscles, methods that don’t involve compromising our stances. A good, strong, dynamic, fast stance has no unnecessary hinges anywhere—not at the knees, not at the hips, not even at the ankles. Knees and hips are arched, ankles are springy. The stance is pushed downward only as far as it can be pushed without overly bending any joint. You should be well aware that there is as much energy used pushing downward as there is used to resist and push upward. When you can feel this, you are in a good dynamic stance. Dynamic Arches from George Donahue on Vimeo. You might notice from the accompanying video footage that while it is fairly easy to correct most stances, the cat stance is a bit of a challenge. To make a good cat stance, the support leg and hips must be arched rather than hinged. Most of us reflexively settle too far down into this stance, because it feels stable and secure. It is indeed stable, but it’s not secure because it’s too slow. Because the cat stance is so easy to mangle, it might be useful to practice it more than any of the other stances except perhaps naihanchi. Here’s a final piece of imagery to assist you. Sometimes it helps in analyzing a stance to think of the body as being constructed like a noodle. If the noodle is dry and uncooked, then the stance is too high and too brittle. If the noodle is over-boiled, then the stance is too low—droopy, pasty, and weak. What you strive for, as in cooking a pasta dish, is the get to the point where the pasta is al dente, simultaneously firm and yielding. The pasta equivalent of yin and yang. 1 – Various Shorin Ryu traditions had somewhat different emphases, but the core principles remained close among many of the earliest teachers. Similar body mechanics were found in some of the Naha-te traditions, particularly in Chojun Miyagi's Goju Ryu as it evolved first with Miyagi (after his teacher Higaonna's death in 1915 as Miyagi trained with fellow Shorin ryu and White Crane teachers) and his principal students who continued to teach their understanding of Goju-ryu after Miyagi's death (also giving special emphasis to posture, breathing, body hardening and strengthening). Thus, while much of early Okinawan karate may have shared some common elements of internal body mechanics, the elements of koshi, compression and arches were most pronounced among many, although perhaps not all, early Shorin-ryu teachers. This type of internal body mechanics was quite likely brought to Okinawa by Chinese martial artists in the seventeenth and eighteenth centuries (perhaps even earlier), then modified and adapted (some would say improved) to fit the native tradition. Sadly, it should be noted that most of Japanese karate and even much of Okinawan Shorin Ryu and other karate styles have largely forgotten or no longer value the fundamentals of old-style body mechanics.